Superdophilus® is step one in Natren®’s easy-to-use three-step system for optimal internal wellness. Cultured with Lactobacillus acidophilus from either a super strain DDS-1 dairy or vegan vegetarian formula or an NAS super strain dairy-free formula, this high-potency product contains more than 2 billion cfu of viable bacteria per serving size and is available in powder (dairy and dairy free), capsule and vegan vegetarian powder formulas. Superdophilus® works in conjunction with Natren®’s other Trenev Trio® components: Bifidonate® and Bulgaricum®. 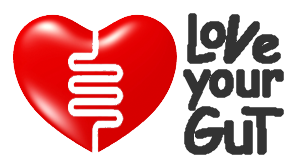 The Lactobacillus acidophilus super strains used in Superdophilus® reside along the wall of the small intestine, where most of the digestive process takes place. In the powder form it begins working in the mouth and provides benefits throughout the entire digestive tract. This beneficial bacteria super strain produces natural substances such as hydrogen peroxide which are particularly helpful in guarding against certain harmful bacteria, regulating yeast and detoxifying the G.I. tract. 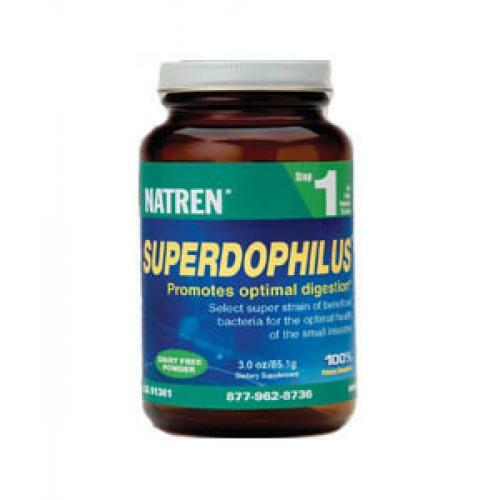 The DDS-1 super strain and the NAS super strain are substantially more potent than regular acidophilus powders or capsules when grown according to exact scientific specifications by using Natren®’s proprietary formula. Maximises food absorption by producing enzymes which aid digestion. Is available in a strictly vegetarian formula known as Mega Vegi-dophilus®. Helps alleviate gas, bloating and upper G.I. problems. Produces H2O2—found necessary to inhibit vaginal yeast. Neutralises the formation of toxins. Dairy powder: Viable Lactobacillus acidophilus, DDS-1 super strain on a culture base of nonfat milk and whey. Added benefits from the natural supernatant (culturing medium) are maintained by Natren ® 's proprietary Trenev Process ® . Contains no preservatives, artificial colours or flavours. Dairy Free powder: Viable Lactobacillus acidophilus, NAS adhesion super strain on a culture base of organically grown garbanzo bean (chick-pea) extract and cellulose powder. Dairy Free capsules: Viable Lactobacillus acidophilus, NAS adhesion super strain on a culture base of organically grown garbanzo bean (chick-pea) extract, cellulose powder and dehydrated potato powder in a veggie capsule. All formulas receive added benefits from the natural supernatant (culturing medium) that is maintained by Natren®’s proprietary Trenev Process®. Contains no preservative, artificial colours or flavours. How the bacteria are grown: Superdophilus® comes in a milk base, and is also available in a milk-free formula grown in an organic garbanzo-bean base. Potency Guarantee: 1/2 teaspoon ( or one capsule) contains a minimum of 2 billion cfu viable bacteria through the printed expiration date when the storage conditions stated on the label are maintained. Suggested Use: 1/2 teaspoon daily, mixed in unchilled, filtered water, preferably on an empty stomach, or 1 capsule daily. May repeat throughout the day as desired, or increase amounts and frequency as deemed necessary. Optimally, take with Natren®’s Bifidonate® and Bulgaricum® as part of the Trenev Trio® programme. Remember, always refrigerate, do not freeze or put in direct sunlight.